← How do I do this? So I’ve decided that a great way to beat the blues when you are with young children is to just fake it till you make it. Before I figured this out, I did a couple of things: owned those feelings, shared those feelings, and took some deep breaths. You see, I was given sad news just before my work day started. I had to continue with my day, and luckily, we were able to splash in some mud puddles. The kids noticed that I was sad, and so I just said, “yes I feel sad” and guess what? They gave me hugs. After that, they went back to their mud puddle. Deep breathing and watching the splashes were just what I needed to clear my head. The rest of the day, I tried to just be in the moment and enjoy. At times that it was more difficult, I chose to fake it. It worked, I faked being myself until I just felt like myself. 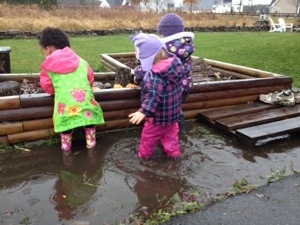 But seriously, mud puddles are like magic!